St Francis Church (57). 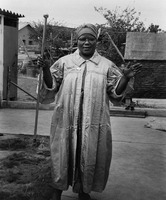 Mrs A Nakeli, Prophet, Lady Bishop - and domestic worker. See Martin West, Bishops & Prophets in a Black City, Chapter 6 and particularly pp101-103 &114-116. Bethesaid Healing Faith Mission (49). Sunday service. A cake for the anthropologist for attending the service! Bethesaid Healing Faith Mission (49). Sunday service. The Prophet blesses the congregation. the position of the Bishop & Minister indicates their peripheral role. Bethesaid Healing Faith Mission (49). Sunday service. Praying for the congregants who have just taken holy water. Bethesaid Healing Faith Mission (49). Sunday service. Drinking holy water. Bethesaid Healing Faith Mission (49). Sunday service. Drinking holy water - see Martin West, Bishop s & Prophets in a Black City, pp 94-95. Bethesaid Healing Faith Mission (49). Sunday service. Bethesaid Healing Faith Mission (49). Sunday service. Church members pose for a photograph after the service. Bethesaid Healing Faith Mission (49). Sunday service. Mrs Mkhize, Lady Prophet & women members of the congregation. Bethesaid Healing Faith Mission (49) Sunday service. Bishop S Mkhize & Mrs Mkhize, Prophet & Lady Bishop , 119 Mkhize St, Mofolo North. Mrs S Mkhize, Prophet & Lady Bishop of the Bethsaid Healing Faith Mission (49) 119 Mkize Street, Mofolo North. She is Mrs SM in Martin West, Bishops & Prophets in a Black City. See in particular Chapter 6. Mrs A Nakeli, Prophet & Lady Bishop of St Francis Church (57) with a traditional diviner. Sacrifice at St Francis Church (57), as described in Martin West, Bishop s & Prophets in a Black City, pp 182-3. Here Mrs A Nakeli, Prophet & Lady Bishop of the church, lights the fire.